In this article, we’ll show you how to create a website using WordPress for 2018 and 2019. We’ve found that a great website design will stay relevant for at least two years, and for this step by step tutorial, we’ll use a premium WordPress theme to create a fully responsive website that looks great on all devices. The website we’ll create together is SEO friendly with a fast page load speed, features an optimized UX design, and includes an intuitive and beginner friendly drag and drop page builder. The theme we’ll use comes with a number of prebuilt designs that you can leverage in just a few clicks to create a stunning website. So, regardless of what type of website you want to build, we’ll provide you with the tools you’ll need to do it. For this tutorial, we’ll use the Ultra theme by Themify. To access a discount code that gives you 30% off, subscribe to the OHKLYN newsletter and you will be sent a welcome email with the discount code included. Similarly, for this tutorial we’ll show you how to set up your WordPress website using Bluehost as your hosting provider. With the link below, you’ll get access to discount hosting and a free domain name, if you haven’t purchased one already. We recommend Bluehost as they provide great quality hosting at an affordable price. They have an intuitive user dashboard, they will also automatically install WordPress for you, and provide 24/7 support, making it the ideal option for beginners. As an affiliate partner, they’ll also set aside a few dollars to help fund future free tutorials like this one – so, thanks for using the links provided. You’ve heard the cliches: Preparation prevents panic, if you fail to prepare, then prepare to fail, and…when it comes to creating a website with WordPress, they’re all true. By taking a couple of moments upfront to put together a game plan for creating your website, you will save yourself a lot of time, and create a much better outcome. User experience or UX design is the process of planning out the content and structure of your website to optimize the user experience and improve engagement. You may have more, or less, but make sure you draw it out. Next, for each page, create a rough guide for what will be on the page in terms of text, images, videos, and other elements, such as counters, bars, testimonial sliders, etc. Will there be a sidebar? If so, on what side, and what will be included within the sidebar? From a user experience perspective, you should think about the most important action that you want the user to take on that page, and make sure it’s both above the fold (meaning, it’s visible when the page first loads), and it’s obvious and / or repeated in a way that makes it easy for the user to engage. Similarly, use buttons and your brand colors to draw the user’s attention to importing pieces of content. You also need to consider how users will consume your content. Typically, content will be consumed from top to bottom and from left to right. If your target market consumes content differently, make sure you’ve considered this. Does the flow of information you’re presenting make sense? Does it logically take them through a process, or tell a story? Once you’ve outlined the pages you want to include on your website, and the rough layout for each page, you’ll then need to start writing the copy, sourcing or designing the images and graphics, and planning the navigational elements. Go through each page layout, write the content for each section, and decide on the media elements you want to use. Check out our Best royalty free stock photo sites article for a list of free high-quality stock photo sites with images that you can use for free on your website. You will need a small budget of around $150 – $300, depending on the options you choose. Once you get started on that, or if you’ve already got that under control, we can move on to setting up your new WordPress website. The first step is to register your domain (if you haven’t already), set up your website hosting account, and install WordPress. So we’re all on the same page, let me quickly explain what they are. Hosting, is what allows your website to be accessible to users 24/7. It’s the process of storing the content and data for your website on a web server, and serving it to users. Head to the bluehost website (massive hosting discount up to 54% + FREE domain).The free Bluehost domain extensions included are (.com, .online, .site, .website, .space, .tech, .store, .net, .org, .info, .co, .us, .biz, .club). Choose your desired hosting term and domain add-on preferences. We recommend selecting ‘domain privacy protection’ so that your personal information isn’t associated to your domain and publicly available (optional). Congratulations! You officially have a new website! It’s not much at the moment, but you’re a lot closer than you realize. 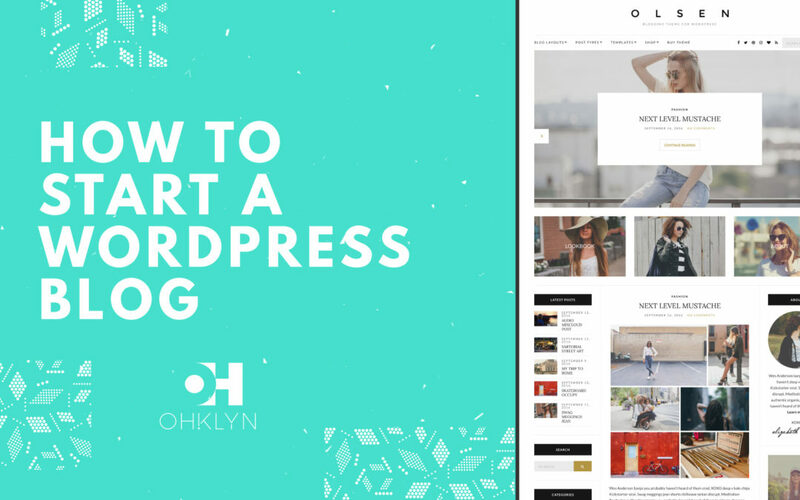 Alright, we’ve gone through the first two steps which were preparation, as well as registering your domain, setting up hosting, and installing WordPress. We can now move on to the next step. Whenever you want to log into your WordPress website, enter your domain and add /wp-admin to the end (i.e example.com/wp-admin). Then enter your username and password that you set up in the prior step. You’ll then be taken to your WordPress dashboard. The WordPress dashboard or admin panel is broken down into 3 main sections: at the top we have the WordPress toolbar, the menu or admin menu is located on the left-hand side, and the main admin area is in the middle, where we’ll do most of our work. The WordPress toolbar at the top is dynamic, and adjusts the available options depending on which page you’re on, and if you’re viewing the page from the front or backend. The default option, leverages a more journal approach featuring the date in the permalink. However, the more common option and what we’d recommend from an SEO and UX perspective, is post name. So we’ll select that option. If you want to update your user profile, or add users to your website, you can do this by hovering over ‘users’ in the admin menu on the left, and selecting from the options there. For this tutorial, we’ll use the top rated business website theme – Ultra by Themify. For 30% OFF, subscribe to the OHKLYN blog and you’ll be sent a welcome email with an exclusive discount code. You will upload the theme file as is, so there’s no need to unzip the file. Next, we’ll upload the Ultra WordPress theme. If you want to install a child theme you can either use our free child theme generator. Alternatively, you could also use a plugin called Child Theme Configurator to help set this up. This is best practice but not essential. Click ‘Install now’. This will start the process to upload and install the Ultra WordPress theme. You will then be taken to the Themify settings page. Once the Ultra theme has been installed, you can navigate back to this page at any time by hovering over the newly created tab called ‘Themify Ultra’, and selecting ‘Themify settings’. Or, by heading to the Ultra theme page, and then scrolling down to the demos section and following the link to the specific demo site. Once you’ve clicked on the skin you want to use, you’ll notice that you get the option to import the demo content. If you’ve already got content on your website, you won’t want to import the demo content. Once you’ve installed the required plugins, navigate back to the ‘Themify settings’ panel by hovering over ‘Themify Ultra’, and selecting ‘Themify settings’. Head back into the ‘Skins & Demos’ tab or refresh the page, and we can now select the demo we want to use. In this case, we’ll go with the agency skin, and click on the ‘import’ option to bring in the demo content for our website. So far, we’ve gone through setting up your WordPress website, uploading the theme and required plugins, as well as how to leverage the demo content to get up and running quickly. For this tutorial, we’ll create a new page, and set this as the homepage for our website so that you’re aware of how the homepage is set for your website. Alternatively to create a new page, click ‘add new’. Go through and create the rest of the pages that you want to include on your website by following the same process. Paint in broad strokes for now, as we’ll get to how to use the Themify builder to customize your pages shortly. If you want to include a blog on your website, you’ll create blog posts the same way. The only difference being that you’ll need to set up categories first. The default blog page will feature your recent posts, unless you create a custom blog page and set it as your blog page via the reading settings tab, like we just did for the homepage. For more details on anything we covered (or didn’t get a chance to cover) in this tutorial, follow the links below to the Ultra or Themify Builder documentation pages. Here, you can access over 10 hours of detailed content, covering every element of this theme. By now, you should have roughly created the pages, posts and categories for your website. Don’t worry if it’s not perfect or if you’re not 100% sure on the exact structure – remember, broad strokes. What we’ll do now is go and create the menu structure for your website, so you can easily navigate through your website while you continue to build out your layouts and content. To add more options, click on the ‘screen options’ tab at the top and check the boxes next to the elements you want to add to your menu. For example, ‘tags’. Under ‘screen options’, you can also enable the ability to set the link target for a menu item, which means whether the link opens in a new tab or not, as well as assign CSS classes, which is slightly more advanced than what we’ll cover today. 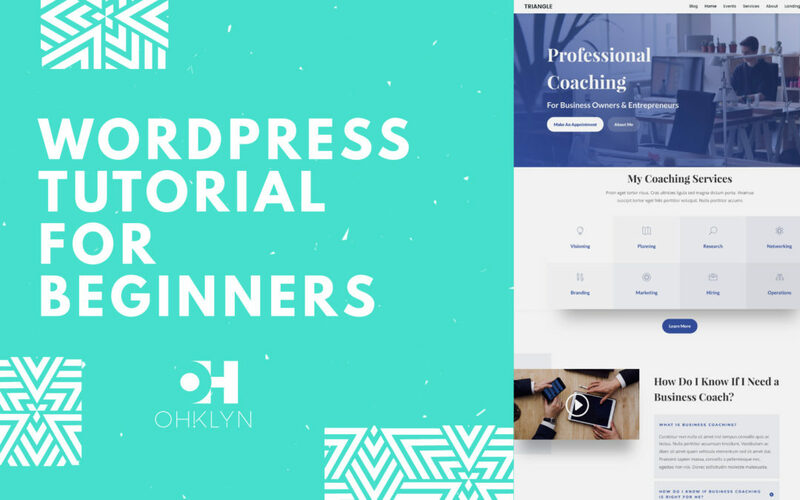 However, if you’re interested in learning some HTML and CSS fundamentals for WordPress, register for one of our courses at courses.ohklyn.com. On the right-hand side of the menus panel, you have your menu structure. If you uploaded the demo content, a main menu and a footer menu would’ve been created for you. If not, you’ll need to create a new menu. One great feature of the Ultra theme is the ability to include mega menus which are great from a UX perspective as they allow you to show large amounts of information in an efficient way. Remember to refer to the documentation for further information regarding the menu options available with the Ultra theme. We’ll now move on to the global theme settings where we can begin customizing your website to reflect your brand and design style. The great thing about the Ultra theme is that there are so many options. What we’ll do in this section is cover the things that will be important to everyone, such as setting your favicon, amending your website’s header and menu layout, and setting the default layout for pages, posts, and other global elements. To access the Themify settings, from your WordPress dashboard hover over ‘Themify Ultra’, and select ‘Themify settings’. We’ll go through the ‘settings’ tab, and cover off the fundamentals you need to know. Before we jump into the Themify settings, it’s probably best if we explain a few things first, to ensure we’re all saying the same thing. As far as published content goes, the basic architecture of WordPress includes static pages, individual posts, portfolio posts, and archive pages. Static pages are the pages of your website where the content is relatively static. For example, your homepage, about, contact page, etc. Individual posts are the blog posts you create that are relevant to your business, industry, or niche. Individual posts are grouped by categories which serve as an organization tool, and provide additional context and meaning to users. Tags can also be added to individual posts. Individual portfolio posts are most commonly used to showcase examples of work, or case studies, etc. These function in a similar way to individual posts, where they are associated to a category. Archive pages are typically the category pages and showcases the individual posts or portfolio posts associated to that specific category. Essentially, these pages act as an archive of associated posts. For example, if you have a lifestyle blog, you may have a category called ‘fashion’ with a number of individual posts related to fashion. If you were to click on the fashion category link on your website, you would be taken to the fashion archive page, which would display all the posts related to fashion. This page is what’s referred to as an archive page. Ok, so hopefully we’re all on the same page. Below is the main things you will need to update in the theme settings by tab. This is where we set the default layouts for pages, individual posts, and archive pages as we discussed before. A number of the layout options will include the placement of the sidebar on your website. The sidebar in WordPress is referred to as a widget enabled area, and allows you to set a global sidebar that appears on all pages, posts, or archive pages – where a sidebar is enabled. Themify Ultra has two sidebar widget enabled areas that you can leverage – these are the standard sidebar and a narrow sidebar which you can include in your design. If you’re new to WordPress, review the documentation to get your head around widgets and widget enabled areas as they are a powerful feature. Widgets are managed in their own dedicated section which you can access by hovering over ‘appearance’ in the admin menu on the left, and selecting ‘widgets’. If you imported the demo content, there may already be widgets added to the various sidebars and other widget areas. Theme color & typography – Here you can access the basic settings, however, you have more control over these settings in the theme customizer panel. Header design – There are more than 15 header options that will dramatically impact the look and feel of your website. Depending on which header option you choose, the customization settings will vary. Footer design – This is where you’ll set your global footer design and widget structure. In this tab, you’ll manage the social platforms you want to include on your website, how they’re displayed, and add the links to your accounts. To amend the details of an existing social link, just update the details you want to change, for example the link details, then select ‘save’ to commit the changes. To delete a social link, simply click the ‘x’ icon, save your changes, and the social link is removed. Ok, so those are probably the most important aspects of the Themify Builder. However, please go through the rest of the options and refer to the documentation for further details. It’s worth noting that within individual pages and posts, you have the ability to override the Themify settings for a specific page, which is a really powerful feature allowing you even more control over the design of your website. Most of what we need will be in the basic tab, however as the name suggests, we can access more advanced options in the advanced tab if required. Now, we’re not going to go through all of the options, however, what we will do is go through the most important ones like adding your logo, setting your brand accent colors, and updating the global fonts, etc. so that you have a solid understanding of how to use the theme customizer. Here we can choose between using the site title as your logo, uploading a logo image, or setting no logo, we’ll choose the logo image option. The best way to get up to speed with all the available options is to have a play around, and see what works best for your design. Reviewing the documentation and video guide for this section is also a great way to explore your options further. We recommend setting your global font styles here as opposed to doing it on individual pages, primarily because, if you change your mind later and want to adjust anything, you only have to do it in one place rather than on every page. It will also ensure your design is consistent throughout your website. Ok, hopefully you’re feeling relatively confident to go and customize your website further. The only way to get good at this, is to get your hands dirty and play around with the various settings to find out what’s right for you. Once again, review the customizer tutorial and documentation for more details on any of the settings. To ensure you’re comfortable using the Themify Builder, we’ll go through an example of how to customize one of the prebuilt layouts to suit your website design. We’ll also show you how to create a page from scratch using the Themify builder modules and prebuilt rows. As everyone’s needs will be different, it wouldn’t make sense for us to go through all of the options here. Instead, we’ll cover the fundamentals of how to use the builder, and get you up to speed with the most common features. If you want to dive deeper into anything along the way, refer back to the theme documentation that we’ve provided the links to. Then click the ‘turn on builder’ option from the toolbar at the top if it hasn’t launched already. This will activate the drag and drop page builder, which is one of Ultra’s best features. Refer to the documentation guide below, or the video included in this tutorial, for more practical and in depth examples. Once you’ve got your website looking the way you want and you’re ready to launch, there are a few best practices that you should follow to ensure you get the best results. Keep this box checked while you’re still working on your site, but uncheck it once you’re ready to go live. Once you’ve done that, we recommend watching our step by step video on how to index your website using the free Yoast SEO plugin and Google Search Console. This will help make your website discoverable via search engines like Google. We would also recommend installing Google Analytics on your website. You guessed it, we’ve created a free step by step video on how to do this as well. With the Ultra theme, you can add the required tracking code within the Themify Settings section. That wraps up our how to create a website using WordPress tutorial for 2018 and 2019. We hope you enjoyed it, and are ready to launch your new website!